This morning I woke up at a much more reasonable 6.50am, the others didn't get up until well after 8. Breakfast this morning was a similar affair for Dd and DH with the cereal and I had my cupcake from sprinkles. 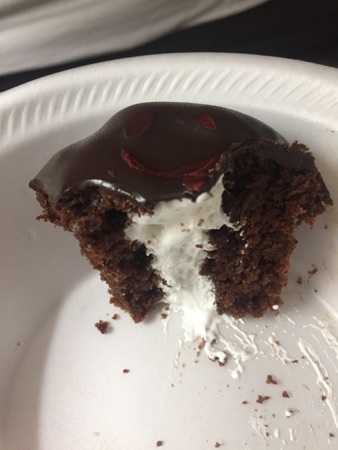 This was a chocolate marshmallow cupcake. We set off to Hollywood studios at 9.40 and arrived in the carpark less than 10 minutes later, I love arriving at Hollywood studios from off property as you get to use the main entrance. We got into the park and made our way to our first fastpass which was for star tours, I'm not a fan of Star Wars but quite enjoy the ride. Next up was our toy story mania fastpass, this would probably be our one and only opportunity to ride it this holiday as the fastpass queue was closing to be resituated from next week. 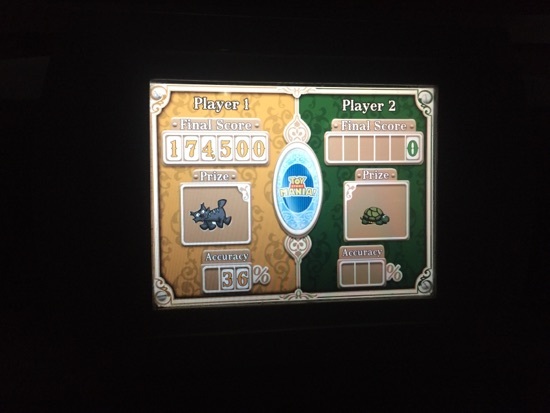 I thought I'd done pretty well with my score of 174,000 but DH beat me with 189,00, which also happened to be the highest score of the hour and he didn't let me miss that fact. We came out of TSM and walked over to the animation courtyard where we queued to meet DD's favourite for the second time in two days, doc mcstuffins. The queue wasn't very long which was surprising as the queues we'd seen so far had been ridiculous - 70 minutes for star tours at 10.30am. After saying hi to doc it was time for our third and final fastpass which was the tower of terror, the queue was showing as 105 minutes, we've often walked through the fastpass queue for this ride and wondered whether they ever use all of the outdoor queue sections, well we saw today that yes they do! Dd wasn't too keen on tower of terror this time and didn't really enjoy it, we think the people screaming scared her more than the ride. DH has the 1/3lb Angus bacon cheeseburger. 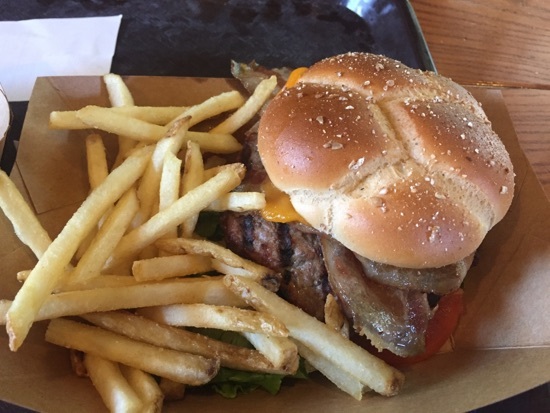 Lunch was fine and we all enjoyed what we had, DH's burger doesn't look the most appetising to me but he said it was fine, the total came to $23.95. Before lunch I had managed to grab a further fastpass for the frozen singalong at 1.30pm so that's where we were headed next. 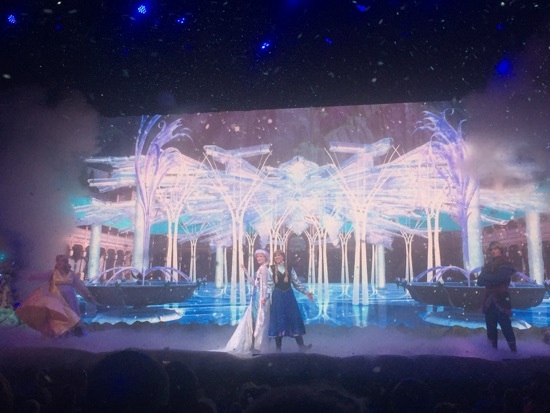 I'm not ashamed to admit I know all the words to these songs so love belting them out in the singalong, the snow at the end really makes the whole thing for me. 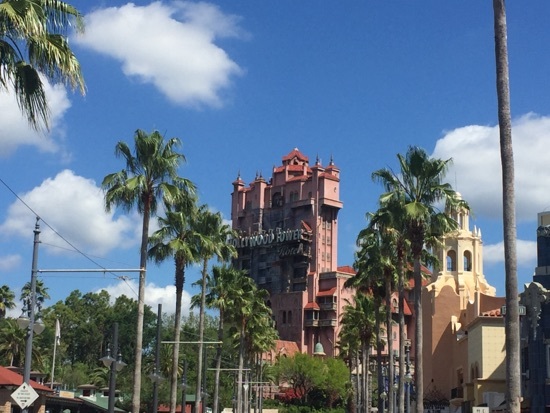 We decided to call it a day in Hollywood studios and as it was such a pleasant day we made the lovely walk along to the boardwalk. We came across amplehills creamery which is one of my favourite places in Disney, it would be so rude not to call in for some ice cream. None of us could decide what flavour to get so we got the flight between us to share, this is 6 small scoops of any flavours for $9.49. This worked out really well as it meant we could pick 2 each and share them all amongst us. I picked ooey gooey butter cake and pb wins the cup (peanut butter cup), Dd picked the vanilla bean and strawberries and cream and DH picked the coffee, toffee, coffee and dark chocolate. These were all really good, my favourite was the pb wins the cup, but it love peanut butter anything! There was quite a lot of ice cream here and enough dr us to share between the 3 of us, it did melt very quickly though! 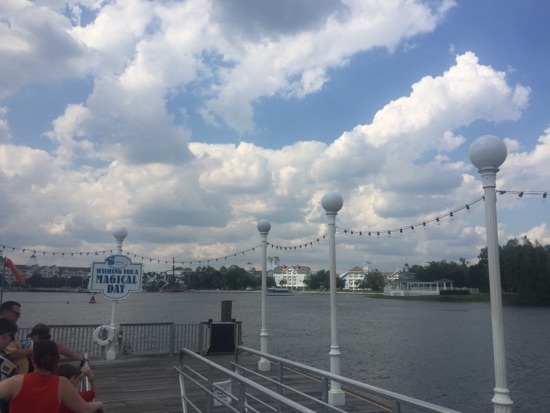 We went for a wander around the resort and then got the friendship boat back to Hollywood studios, I love these boardwalk resorts for their ease of access to Hollywood studios and Epcot. Passing by the beach club got me really excited for us checking in there on Sunday! Rather than heading straight back to he hotel we went straight to sweet tomatoes for some dinner, none of us were massively hungry but we wanted a chilled evening so called in here for some food so we could spend the rest of the evening back at the hotel. We got 2 adult and 1 child's buffet and 3 drinks and it came to $40, this seems to have gone up in price so much and I'm now not sure it's worth the price. 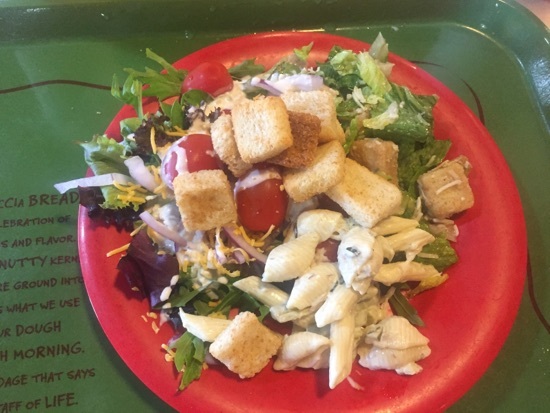 We each got a plate of salad to start, mine had some of the prepared Caesar salad which had been sat a while and the croutons were abit soggy, I also got some tuna tarragon pasta which was nice and a selection of salad stuff with blue cheese dressing added. I never think buffet plates look particularly appetising looking back, they're just a mush mash of different foods. 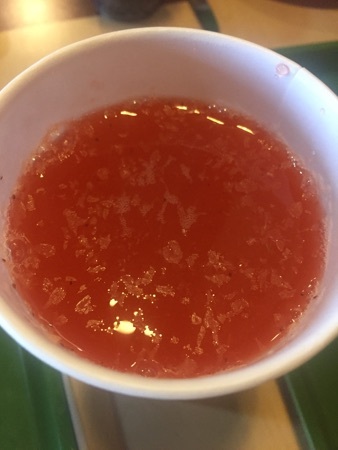 With this we all got a strawberry lemonade to drink, I do love the strawberry lemonade here, it's not too sweet and has loads of pieces in it. Next up I had been hoping they had their French onion soup but unfortunately not so I had to settle for a jacked potato which I added cheese, bacon pieces and onion to, this was very nice. Again does look too appetising - and there was some bacon bits buried in amongst the cheese and onion on there. 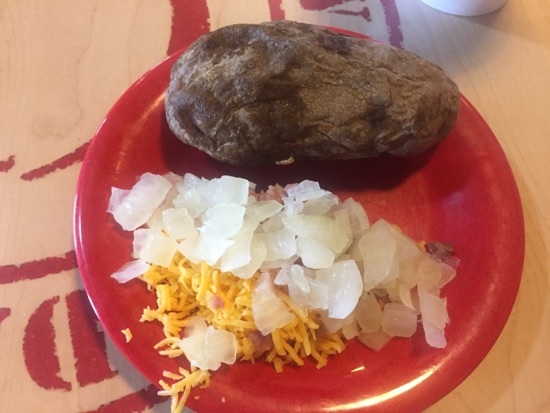 These three all together are what really made the potato yummy with plenty of butter! 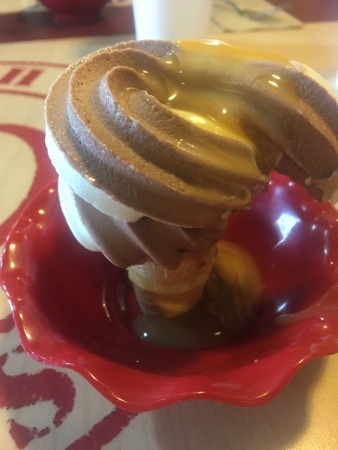 For dessert I had an I cream cone with chocolate vanilla swirl ice cream and caramel sauce, after this I was absolutely stuffed. We all enjoyed our meal here don't get me wrong but compared with what we would pay elsewhere it seems on the expensive side, another example of prices increasing dramatically around here. 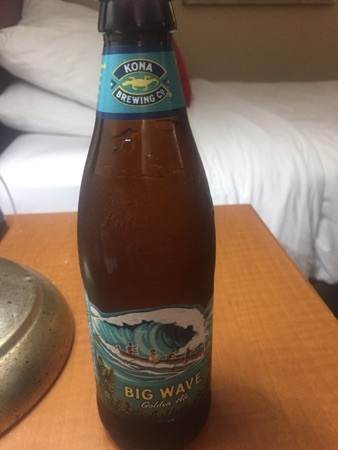 We left sweet tomatoes and called in at public on the way back to our hotel to pick up some milk and some big wave beer for DH. This evening we spent some time at the hotel pool but when the sun went down i got quite cold quite quickly so we made a hasty return to our room where we enjoyed a few drinks. DH had his beer. I had a mango-Rita and Dd enjoyed some nacho Doritos. We all felt like we needed a chilled evening and early night, we don't do &lsquo;rest days' on holiday, we tend to go at it full on until we need some down time and that's where we were at at the moment. Need plenty of rest for tomorrow as the plan is magic kingdom. New Photo Added by missdopey - 5 Apr 18 1:05 AM. Loving all your food photo's! 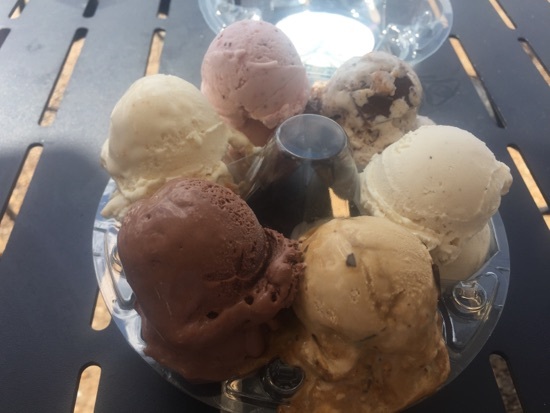 We need to go to amplehills on our next visit, what a good idea to have an ice cream sampler! Do you mean that you love Sweet Tomatoes more than I do or that you love ST more than you love me? 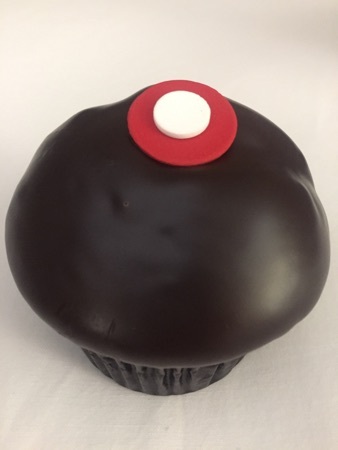 I'm not a dessert fan but that cupcake sounds amazing! Over 51 years married and I get told on a public forum that Joan prefers twelve different types of lettuce.